Left Page, Arizona the morning of October 3rd and headed toward Cortez, Colorado – at the foot of Mesa Verde National Park. We were well aware that Mesa Verde would most likely also be closed due to the Government shutdown, so we decided to make the best of travels by driving through Monument Valley and visiting Four Corners monument on the way to Cortez. 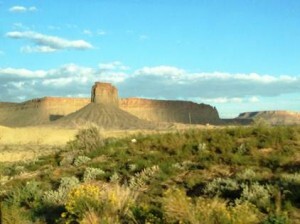 The Monument Valley region extends from northeastern Arizona into southwestern Colorado. At the southwestern end of Monument Valley resides the Navajo National Monument complex of campgrounds, picnic area, and Visitors Center. Unfortunately, it too was officially closed due to the Government shutdown. The Visitors Center was closed, but we were able to “sneak” into the picnic area for our traditional lunch of sunflower butter and honey sandwiches. Fortunately, the remainder of Monument Valley is not controlled by the US National Parks Department, so we were able to traverse the 40 mile length of the Valley undeterred. The folks in Page, Arizona had told us this was a “must see” addition to our trip and that several western movies had been shot in its scenic rugged countryside. Sure enough, we encountered several large buttes and cliff faces jutting out of the sagebrush and scrub tree dotted high desert floor. One could easily envision the good guys in their white hats scrambling on horseback across the rugged terrain and up into the bolder strewn hills after to bad guys with their black hats. I saw my first western in about 1952. Our family lived in a 4-story walk-up apartment building in a low-to-middle class neighborhood in the north Bronx, New York. A youngish professional couple across the court yard had purchased a brand new television (black & white of course) and would invite a few of us kids from the building in from time to time to watch TV shows like Howdy Doody, Captain Video, Flash Gordon, and of course, westerns such as The Long Ranger, Roy Rogers, and old Tom Mix movies. Most of the other guys wanted to watch the westerns, while I preferred the science fiction programs (remember the space scenes with model rocket ships hanging from wires and powered by sparklers?). Anyway, I could picture the westerns being filmed in the Monument Valley setting. Next stop was the Four Corners monument. Four Corners is the only place in the United States where the borders of four states intersect (Arizona, Colorado, New Mexico, and Utah). I am not aware of any other notable significance attributable to this site other than the presence of permanent stalls for the sale of Native American goods – they were unoccupied at the time we were there. Interestingly (to me anyway), we had traveled through to point where three states; Kentucky, Missouri, and Illinois, converge on our way west earlier in the Trek. Not sure if there are other similar convergences – good geography quiz question. When we get home we will have to list the states that we passed through on out Trek. 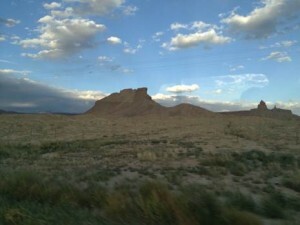 From the Four Corners monument we proceeded to Cortex, Colorado for the evening.